Advance Tickets And Reserved Seating Available Now! 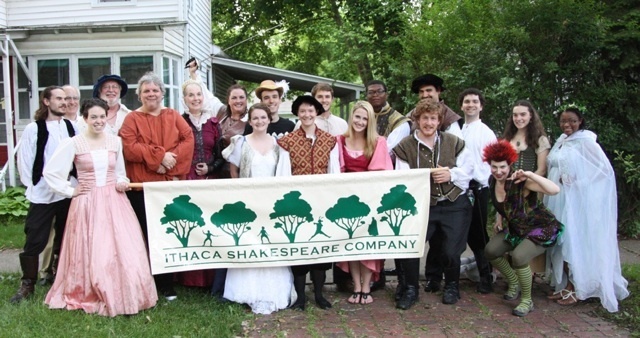 Once again this year, you can reserve seats ahead of time for our summer performances at Cornell Plantations. Get the best seats in the house without having to get there early! Reserved seating is strictly limited, so reserve seats on our website now! General admission tickets are also available online or can be purchased at the entrance before performances. After 10 years of presenting all our outdoor performances on a Pay What You Can basis, it was necessary to set a fixed admission cost for some shows this year. All Thursday performances will still be Pay What Can ($10 suggested) as in previous years. On Fridays, Saturdays, and Sundays, general admission will be $10 per person. Reserved seating is $20 per seat for all shows. 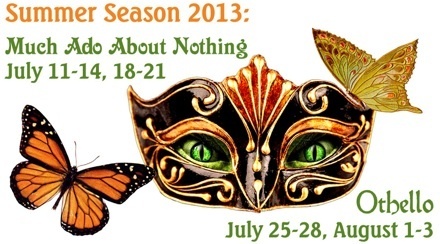 See either or both of this summer's shows for free. Sign up to be an usher! Signing up is simple: just go to this page for instructions on how to use our online ticketing system to sign up for whichever shows you choose! All shows at 6 pm in the F.R. Newman Arboretum at Cornell Plantations. When Don Pedro and his soldiers arrive in sunny Messina for some much-needed R&R, love blossoms and Beatrice and Benedick rekindle their merry war of wit. Don Pedro attempts to out-do Cupid by tricking Beatrice and Benedick into falling in love with each other, while Don John and his drunken henchmen scheme to ruin the marriage of their hated rival. Othello and Desdemona marry in secret and refuse to be parted when Othello must go to war in Cypress. There, against the backdrop of an impending invasion, Othello's most trusted friend — and Shakespeare's most complex villain — plants the seeds that will destroy them all. With penetrating psychological insight, Shakespeare's most emotionally intense tragedy explores the destructive effects of jealousy, racism, class resentment, gender inequality, and the tragic human truth that we can never truly know what another person is thinking.